This is the entrance to the wonderfully restored Tholos Tomb. The ancient archaeological site of Peristeria is located about 8 kilometers to the northeast of Kyparissia, going towards Kalo Nero there is a signposted turning to the right. 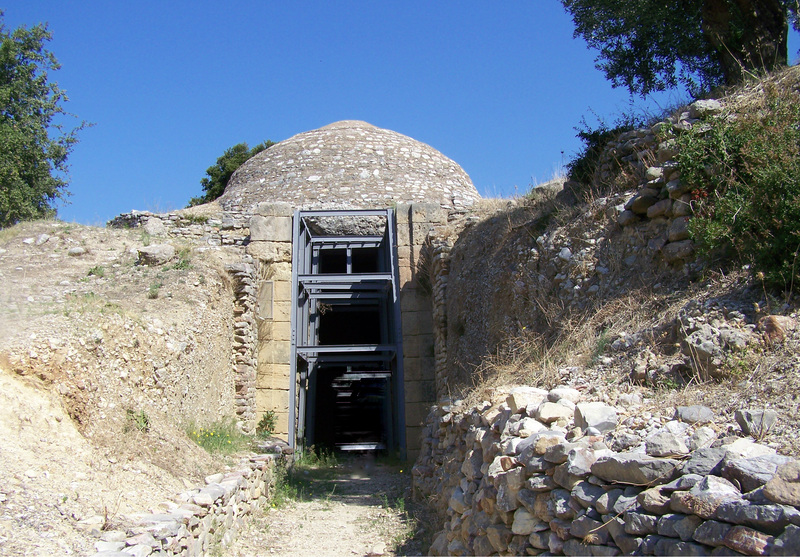 It is a place of special interest and has been declared one of the primary centres of the First Mycenaean Civilization in Greece. On this archaeological site, there are four vaulted graves built into the hillside as well as the remains of a palace and residences. 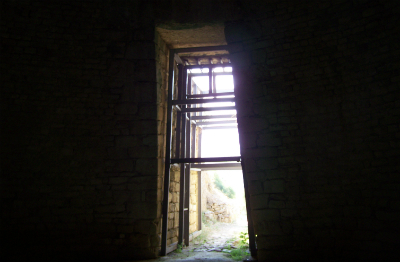 The entrance to the tomb from the inside. At the entrance to the largest tomb you will see some Minoan symbols, including the sacred symbol of the double axe. The site was first excavated by the famous archaeologist Spiros Marinatos in 1960 and later on by Professor Georgios Korres. 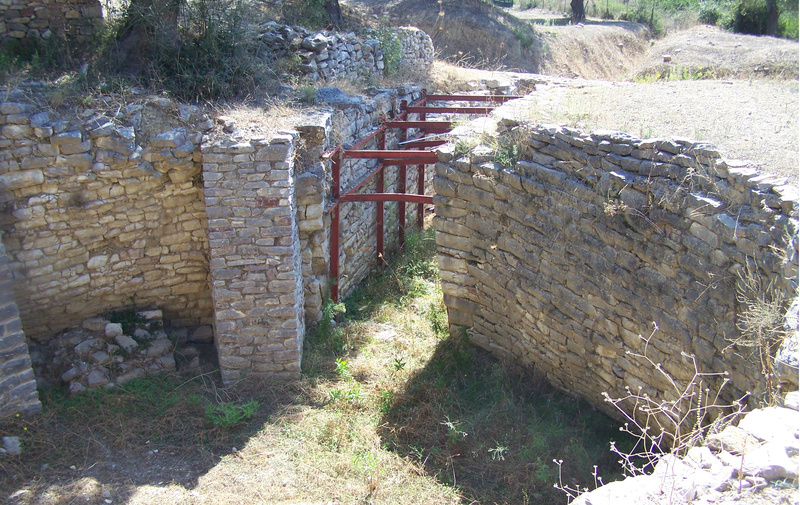 Peristeria is a large Mycenaean city of which only a small part has been excavated. 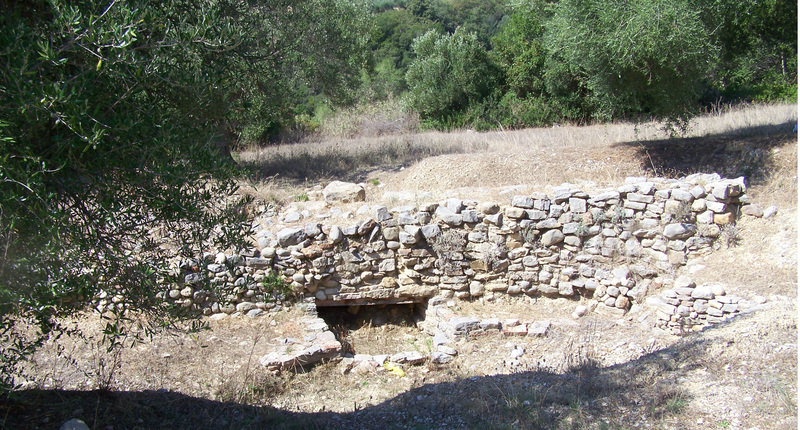 The ancient settlement belongs to the Protomycaenic Period 17th to 16th century BC., but houses have been found belonging to the Mesohellenic Era - 2200 to 1580 BC. Among the valuable finds are the remains of four houses, four domed vaulted tombs, a wall surrounding the tombs and remnants of a wall which surrounded the hill of Peristeria to the south. The photograph shows the remains of one of the other Tholos Tombs. Part of a wall surrounding the tombs. Rich grave gifts were uncovered beneath the floors of the tombs, which points to the fact that maybe the tombs were constructed for the local rulers. The tombs with their beehive-shaped burial chambers have a typical circular chamber with a corbelled roof. 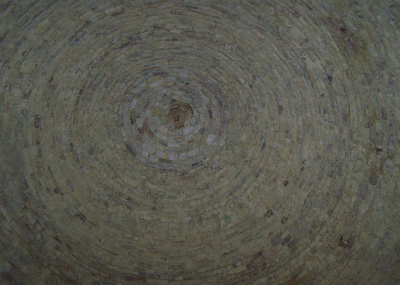 The vault can be accessed down a stone-lined passage. In 1976, the excavations of Professor Korres uncovered golden jewellery, three golden cups, quite a few peices of pottery including large vases, golden horseshoes, spear points, golden rossettes, a double edged tool made of hornstone and a golden owl. Also found were small and large bowls with intricate spiral decorations fixed onto small sheets of gold bearing the shapes of leaves, flowers or birds. Some of the designs are so tiny that they can only be seen through a magnifying glass. Photograph courtesy of segal017 at Flickr. Most of the finds are displayed in the Archaeological Museum of Chora which was founded in 1969. 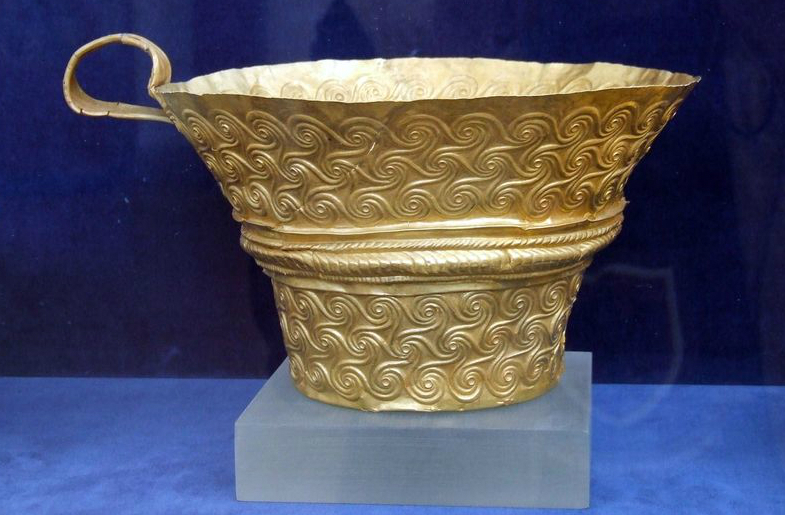 It is located in Chora of Messinia and has three rooms, with objects mainly from the Mycenaean period. 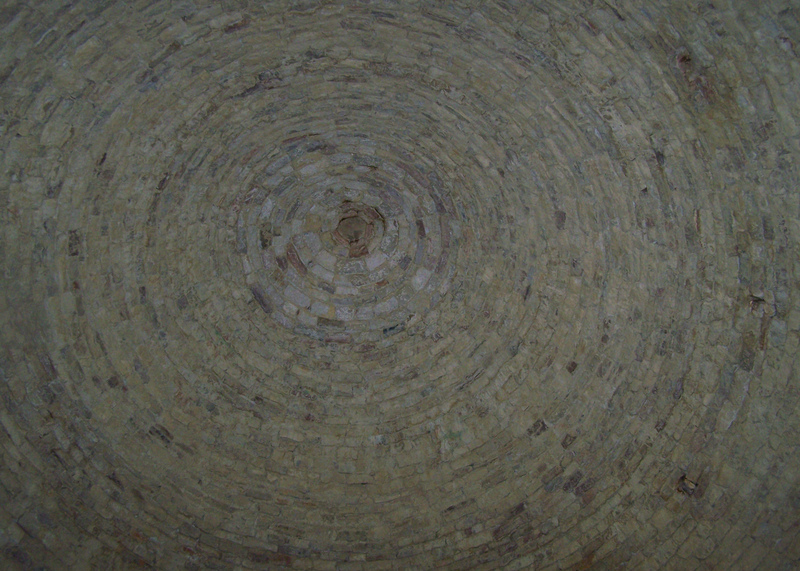 There is a special place one of the rooms for wonderful group of finds from the three tholos tombs at Peristeria. 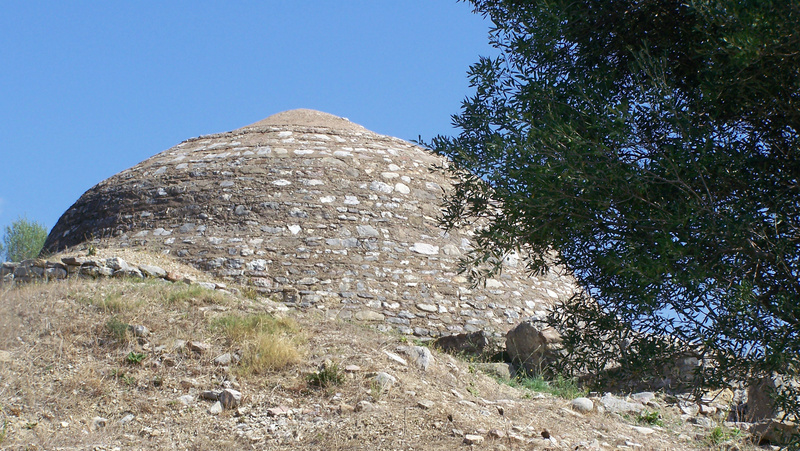 The renovated Tholos Tomb at Peristeria is the only one that I have seen that does not have the top covered over, so you can see why they are called 'beehive' tombs. It is not until you walk inside a tomb that you realise exactly how immense they are. The intricate stonework inside and outside is so beautiful, the builders must have been such craftsmen! The tombs usually contained more than one burial, in various places in the tomb either on the floor, in pits and cists or on stone-built or rock-cut benches, and with various grave goods. After a burial, the entrance to the tomb was filled in with soil, leaving a small mound with most of the tomb underground. 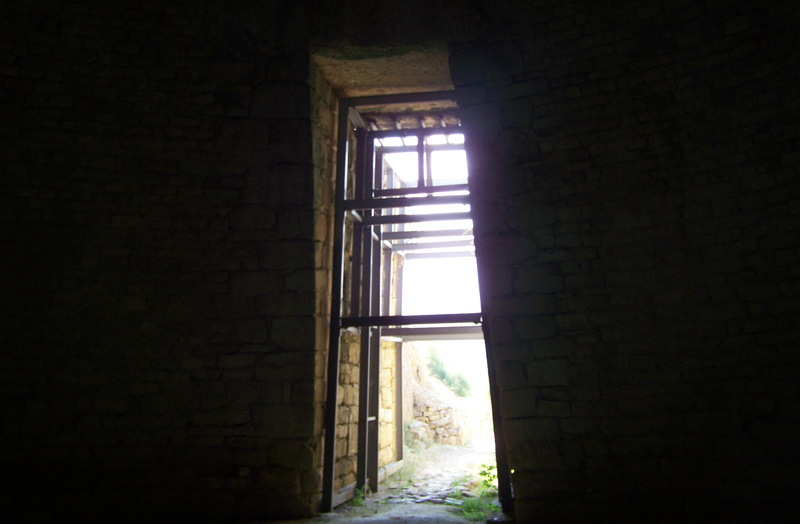 The Archaeological Site is open every day apart from Monday, from early in the morning until 3pm. 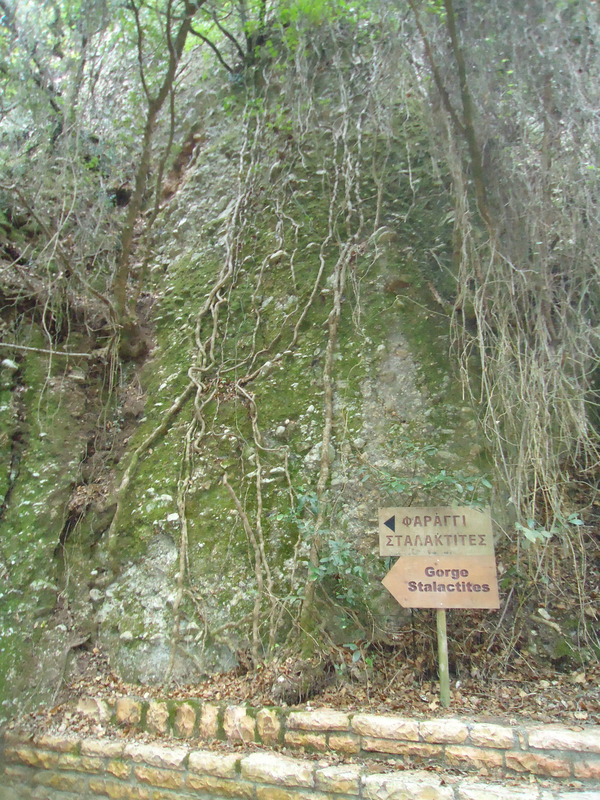 Just to the right side of the Archaeological site of Peristeria, there is a sign sending you down a lovely path lined with bushes and trees. You also walk though a small pine-forest. It is not an easy path so you need good walking shoes, and if you visit in summer you need to take water with you. At the end of the path after walking for 20 to 30 minutes you arrive at the spring with fresh running clear water. 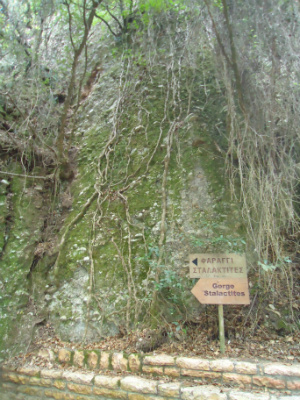 There are old plane trees and a very interesting gorge. The Arcadian River runs along certain parts of the route. 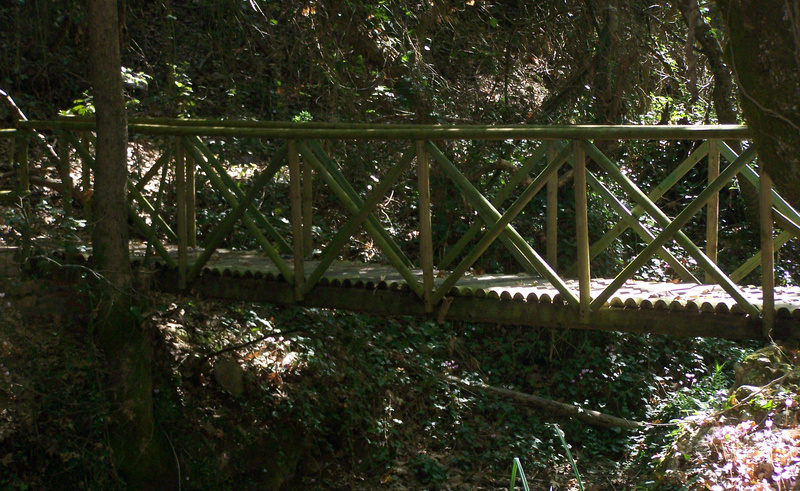 When I first visited the site none of the stonework or the bridge had been completed, so the gorge is now much more accessible. To access the gorge you really need rubber water shoes and if the water is quite deep you will need a bathing suit (but certainly shorts) as you have to walk up the gorge through water. And don't forget your camera! 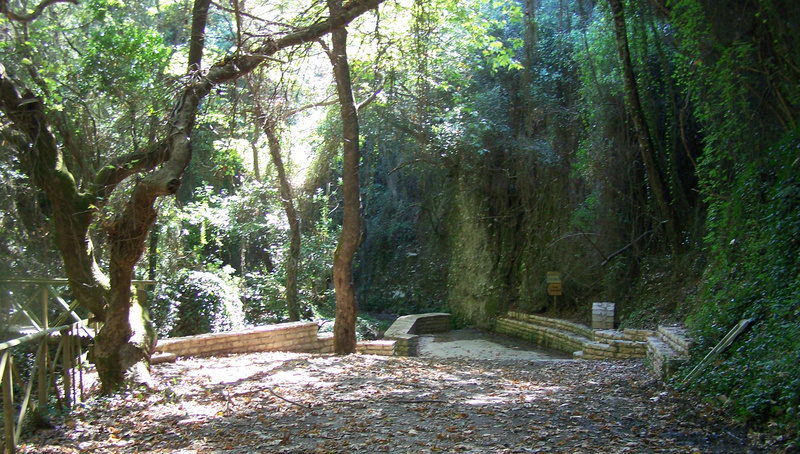 The locals call it Stoixeiorema Gorge, because they believe that nymphs Nereids-Fairies live there. 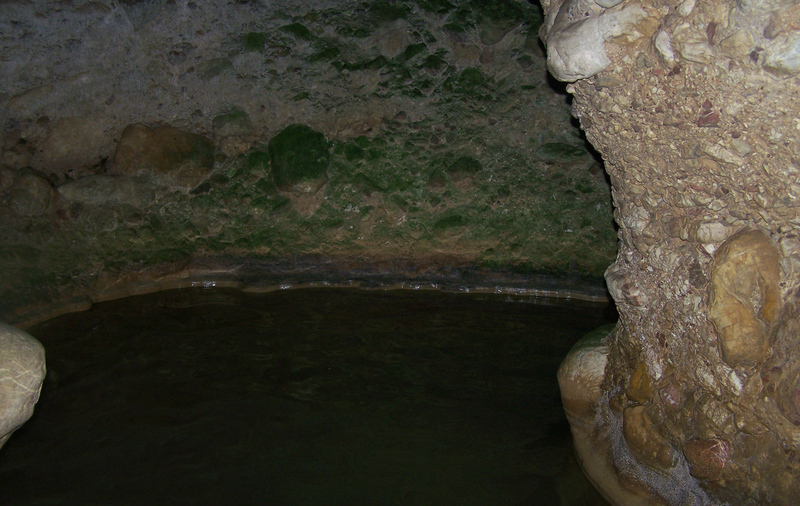 After walking through the water for 10 to 15 minutes you will come to the source of the water as the springs enter the gorge through the rocks. 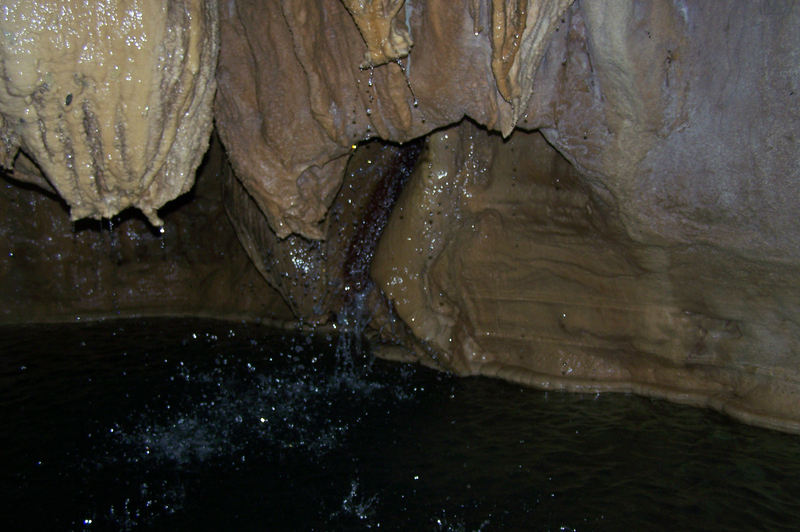 There you will see the beautiful stalactites growing year by year from the roof of the gorge. Although the Archaelogical Site and the Peristeria Gorge are quite a long way from the main road, the drive is well worth the effort and the scenery is very beautiful.